Trading has two important aspects. The first is a successful strategy and its proper execution. The second and equally important one is the psychological aspects of being in a trade. We often focus primarily on the strategy aspect and ignore the psychological aspect that is as integral to success of a trader as his strategy is. Trading is an emotional journey. The fear, the greed the pain, the over-excitement force us to err in our judgement and execution. So , it is important for a trader to be in 'The Mental Zone' , so that he or she can identify, enter, managed and exit trade in a smooth manner. This webinar is all about your inner self and how you can in very little time adopt a mental state where you can approach the market with increased conviction. The objective of the webinar is to improve your mental capability and confidence as a trader. 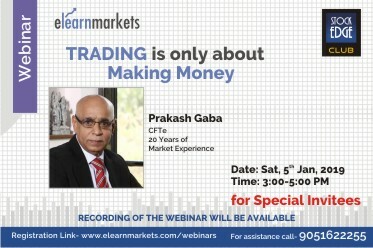 Mr. Gaba is famous trader and analyst and in this webinar he will share the subtle aspects of money making. Prakash Gaba is SEBI registered Research Analyst “& is also a Certified Financial Technician, Technical Trader & a Trading Mentor and a winner of Viewers Choice ’Best Technical Analyst Award’. He has appeared on all Business Channels in the Country and regularly writes for various Newspapers & Magazines and invited for Lectures & Seminars all over the country. He is a regular face on CNBC TV18 & CNBC Awaz.